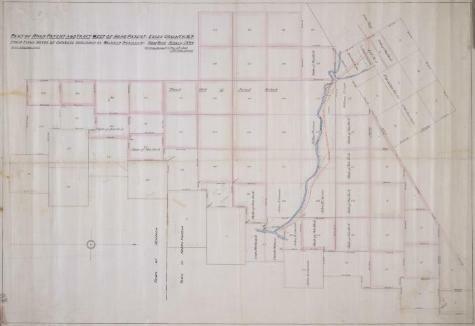 Part of Road Patent and Tract West of Road Patent, Essex County, N.Y.
Map of the Road Patent and a tract of land west of the patent, and either side of the Town of Schroon and Town of North Hudson line. Map based on field notes and surveys by Wihelm Pickhardt published in 1884. State land outlined in pink and includes the Champlain and Sanford Railroad. The scale is one thousand feet equals one inch. Source: Adirondack Museum Library, MacIntyre Iron Works records, MS 65-27, box 2, no. 22.